This entry was posted in aircraft, Future Vertical Lift, FVL by Chuck Hill. Bookmark the permalink. The key thing I see is that the nacelles don’t point down to melt the flight deck. This a/c might be able to resupply small combatants and cutters using a smaller flight deck? I think it is a more viable format for maritime sphere than land. Though I still think it is too complicated for the gains. After some initial problems, the V-22 has proven pretty reliable. The ability to go twice as far, twice as fast is a strong incentive. Helicopters were always complicated anyway. V-22 Osprey and the CH-47 Chinook, approx same operational range, Osprey ~50% faster, Chinook ~20% more payload & larger cabin takes ~50% more troops. 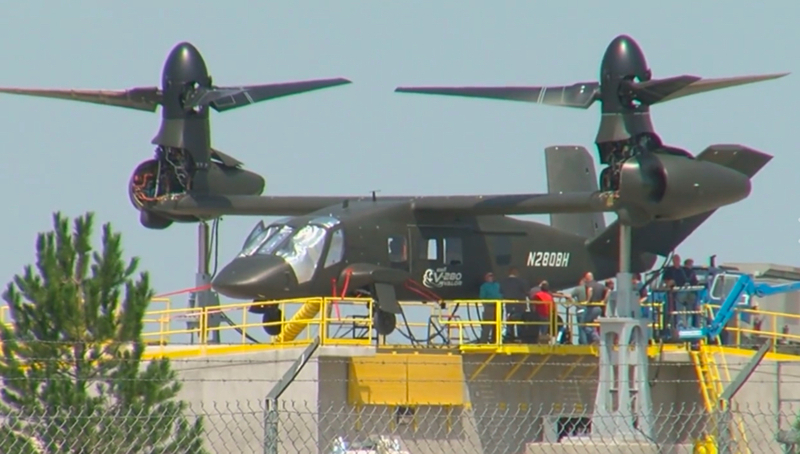 V-22 cost ~$71M vers CH-47 ~$35M. The tilt rotor Osprey is double the cost of a Chinook helicopter, what are operational benefits that Osprey can bring to the party in anyway to justify its very high price. Chinook made overseas sales to 24 countries, Osprey only a single order from Japan for 5, failed to sell to Israel so far even though would be funded US military aid budget. My view tilt rotors not worth cost premium. Army have a current fleet of 2,000 Blackhawks, if Congress funded new FLRRA to same level fleet would drop to 720, max speed ~55% higher, 1.55 x 720 so equivalent to ~1,100 Blackhawks a reduction of current total troop/payload capacity of 45% (assuming an upgraded Blackhawk using the new T900’s-50% more power to replace their T700s, GE recently won contract for T900, giving same payload as a FLRRA). High speed is very, very expensive in helicopters / tilt rotors as in ships, Congress would need fund an additional $25B for ~580 FLRAA at $43M plus the 720 to give Army same capability as now. No doubt Army/Congress will fund a mix of both FLRAA and Blackhawk leading to lower numbers/capacity/capabilities due the very high cost of the high speed FLRAA. “Quantity has a quality all its own” Napoleon/Stalin. More on what the Army is doing. The FARA is more H-65 sized.